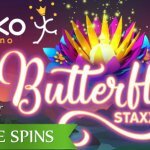 Today, NetEnt fans have the opportunity to play another original slot game developed by the most popular software supplier in the iGaming industry. 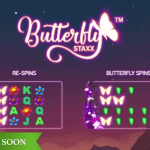 The Butterfly Staxx™ video slot is now available at the many NetEnt Casinos, and even though I’m not super enthusiastic about this new NetEnt game, I’m 100% sure that there will be a large group of NetEnt Casino players that will appreciate the flowers and the bees….uhm…butterflies involved in this low polygonal art-themed NetEnt slot featuring Wild substitutions, Re-Spins and Butterfly Spins. …. is NetEnt’s motto and the company aims to stick to it no matter what. However, the grass always seems to be greener on the other side of the fence, doesn’t it? With some less spectacular games launched by NetEnt in the past few months, I almost(!!) started to believe that this indeed was the case. Until a friend of mine confronted me with a new branded slot game recently released, one not developed by NetEnt. I don’t like to talk bad about any other company in the industry so I won’t mention any names but oh my, I didn’t know I could be so disappointed when it comes to a slot game. Years of reviewing slot games might be the reason why though. All I could think of while playing the branded game was what brilliant things could have been done with the video slot based on such an amazing brand. It simply made me realise that it’s impossible for NetEnt to launch brilliant game after brilliant game. 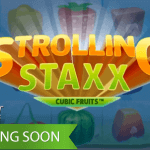 At least, when NetEnt is releasing another branded slot game, it makes sure that it brings you the very best of the brand. You won’t easily find a rush job in a finished NetEnt product, and certainly not when it involves a major brand. 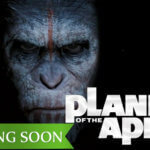 Currently working on branded slots like The Phantom of the Opera™, Emojiplanet® and Planet of the Apes™, we just can’t expect NetEnt to show up continuously with regular games offering the same exciting graphics and gameplay as these branded slots often do, do we? No matter how talented NetEnt’s developers are, I guess they have to accept standards that are lower than is desirable, just to come up with another brilliant slot in the near feature. 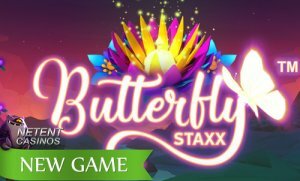 So there it is, the Butterfly Staxx™ video slot, ready to play at the NetEnt Casinos. Maybe not the best NetEnt slot, but certainly one attractive enough for a regular video slot. We can’t keep on expecting the best of the best of the best from NetEnt. 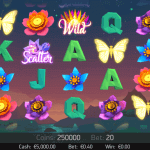 With so many amazing video slot themes and exciting titles brought to the online casino by NetEnt in its 20 years of existence, flowers and butterflies don’t sound too exciting, I know. But the low polygonal art style of the game is giving the game an identity of its own while I’m sure many will be enchanted by the luminous butterflies during the Re-Spins and the Butterfly Spins. 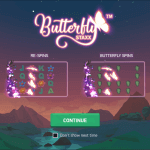 Butterfly Staxx is filled with a range of exciting gameplay highlights, including Wild substitutions, Re-Spins, and Butterfly Spins, which incorporates the popular SuperStaxx™ feature also seen on NetEnt’s successful 80s retro title Neon Staxx™.